"An Exciting Church Excited About Its Mission"
First Calvary Baptist Church was organized in 1884 as Second Baptist Church on Cameron Street which is now Cornell Street. A year later a wood frame building was erected with Rev. Henry Johnson as its first Pastor. Reverend W.D. Smith later became the pastor in 1926 and was responsible for acquiring the current site of the church on Morehead and Kent Streets. From 1926 through 1947 three ministers served as pastors: Rev. E.W. Walker, Rev. H.H. Hart and Rev. C.E. McLester. The church progressed under their leadership and in 1949 the church's name was changed from Second Baptist Church to First Calvary Baptist Church. On Sunday, July 10, 1949, worship service was held for the first time in the new brick building. After the death of Dr. Hart in 1953, the church called the Reverend A.L. Thompson to succeed Dr. Hart on June 29, 1954. Under Rev. Thompson's leadership, the church mortgage was paid off. He then initiated a progressive building plan with the vision of building an education facility. It was at that time that the property adjacent to the church was purchased. Rev. Thompson served as pastor for twenty-five years and after his death, the Reverend V.S. Thompson served as pastor for five years. The Reverend Paul Andrew Jackson seceded Rev. Thompson in 1987. Under his leadership the educational building on the property adjacent to the church was erected. In June 1991, the church body called Pastor Fredrick A. Davis, "A man sent by God." Under his current leadership, the church body has grown significantly. The church has rapidly progressed in all its ministries. With the guiding hand of God, the membership has also not only increased, but the giving of tithes and offerings increased by over 95%. Pastor Davis re-instituted Prayer Service and Bible Study on a weekly basis and implement an early morning Sunday worship service. First Calvary has over forty ministries for people of all ages. In addition to the numerous ministries, Pastor Davis and members of First Calvary Baptist Church envisioned a nonprofit organization to provide programs and services to West End and Durham area residents that foster economic development and community revitalization through education, health care, job training, civic and cultural awareness and housing initiatives. In 1993, Calvary Ministries of the Westend Community Incorporated, a 501(c)3 non-profit corporation was established. In November 1996, Calvary Ministries successfully lobbied the citizens of Durham to approve a bond referendum allocating $6.4 million towards the renovation of the old Lyon Park School. In October 2002, the Community Family Life and Recreation Center at Lyon Park was opened. First Calvary Baptist Church continues to spiritually, physically, and financially support this nonprofit organization. The church underwent a massive expansion project in October 2008. First Calvary broke ground at the same location on Morehead Avenue and Kent Street to re-build a larger church building to include a sanctuary that will accommodate one-thousand worshippers and educational space. Construction was completed in January 2010. 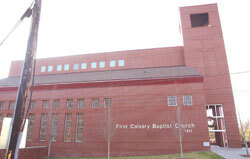 First Calvary Baptist Church is AN EXCITING CHURCH EXCITED ABOUT ITS MISSION.